Isn’t it satisfying to check items off a to-do list? UMASH created a safety resource that allows you to do exactly that. In 2017, UMASH launched a new resource, the Farm Safety Check. The Farm Safety Check can be used on the farm to evaluate a variety of safety topics, ranging from heat stress to manure gas safety to grain handling and more. 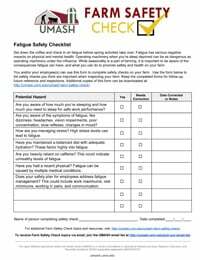 The Farm Safety Check is a printable checklist that can be used on individual operations to identify potential sources of injury, and implement solutions or fixes. We provide a few safety checks for each topic and include space for farmers to customize the checklist to their farm. Suggested resources are included to help address problem areas and provide more in-depth information. With new topics monthly, the checklist keeps farms on track all year without bombarding them with too much new information and additional work. Health and safety on the farm is an attainable goal with some conscious effort in prevention and control measures. Health and safety on the farm is an attainable goal with some conscious effort in prevention and control measures. We aim to share our resources far and wide. The Farm Safety Check can be used in many ways, whether that is checking items off the list, sharing with others, or reading through the resources. Farm Safety Check topics can be a great conversation starter on the farm, on social media, and within agricultural companies to reinforce safety practices throughout the year. Each month, the Farm Safety Check is shared with UMASH subscribers via email and on our social media channels, Facebook and Twitter. 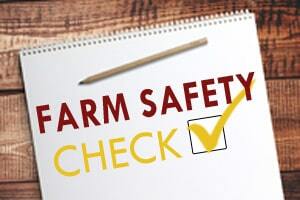 As a result, Farm Safety Check has been featured in farm safety articles of local newspapers, shared by organizations and farmers on social media, in newsletters, and downloaded and printed for use as a checklist on the farm. One Minnesota farm told us they are using the resource to help them develop safety and health plans and protocols on their farm. The Farm Safety Check is a free, quick, already assembled tool that can be used to prevent injuries from happening by identifying and addressing risks. Injuries and incidents cost farms time, money, and even lives, so let Farm Safety Check keep you on the right track each month. The Farm Safety Check is FREE to use and share for educational purposes. If you are interested in co-branding our Farm Safety Check materials, please contact us at umash@umn.edu. National Farm Medicine Center highlighted Farm Safety Check as a resource to start safety conversations on the farm in a radio interview with The Farm Journal Report. The Farm Safety Check is a way to keep safety on the mind of farm families. Local Media Featuring Farm Safety Check: The Illinois paper, Journal Gazette & Times-Courier, used the Farm Safety Check to encourage farmers to check in on safety. In Minnesota, a local newspaper, the Kittson County Enterprise, used the resource to ask farmers if they have a health and safety program in place. UMASH recognizes industry organizations, like Minnesota Corn Growers and Minnesota Milk, have supporting the importance of safety culture year-round in featuring the Farm Safety Check as a resource on their websites and in newsletters. At Universities, the Farm Safety Check resource has been featured in publications from Extension, including newsletters. This resource has even been incorporated into websites specializing in some of the topics, like an electrician in Texas featuring the electrical safety checklist.